In a summer where there have been far too many ‘transfer sagas’ for us all to comprehend, there was an example of resolve in the transfer market that restored a little faith in the footballing world. Thankfully for Everton FC, it involved them keeping hold of their best player in Leighton Baines, something which delighted fans and also garnered the respect of the footballing community as a whole. When it was first reported that Manchester United had put a bid in for Baines, I initially feared the worst. This wasn’t because I viewed Baines as the disloyal mercenary type of player, but more because the pessimistic outlook that Evertonians develop over their lifetime was telling me that things wouldn’t end well. I tried looking at it all objectively for a minute. What if you or I were in a position like his; working at a great company, had a great salary, worked with all your friends, employee of the year etc. Then one day one of the biggest companies in the world comes along and offers to double your salary and enhance your reputation. What do you do? Snap their hands off? That is essentially the situation that ‘Bainesy’ (as he is affectionately dubbed) found himself in this summer. 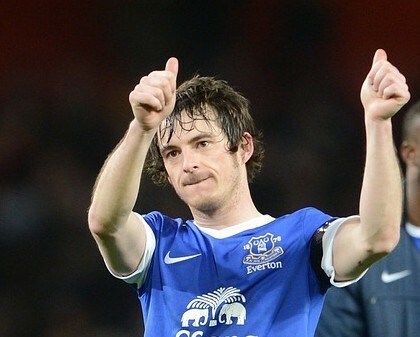 Many would have jumped ship, but Baines did not conform to how the media wanted things to go. In fairness it would have been hard to begrudge the lad a move if he had wanted it. He had been Everton’s standout player over the last few seasons and with the World Cup fast approaching, a move to United probably would have sent the media into overload and helped seal the LB position for his own. Even though he would be giving the same high level performance he had done for Everton, (which seems unfairly unrecognised at times) being at United would probably be the thing to push him ahead of Ashley Cole in the England team. Yet Everton have themselves a player not motivated by greed or selfish desire, perhaps something that United were not prepared for. Baines has always come across as a brilliant professional and a guy who doesn’t like to bask in the limelight. I don’t think any of us have been surprised with how he handled himself throughout the transfer window. Maybe United were actually that stupid with their original ‘derisory’ bid for Baines, but the cynic in me would suggest that the offer was done to unsettle him in the hope he would kick up as fuss and force through a move at a lower price than what Everton wanted. But Baines handled himself with dignity and proved loyal, whereas all around him other players were crying out to leave. “Leighton is a massively important player for us and the future of the football club. We want to do anything we can to reward that and he deserves the appreciation and deserves to know how we feel about him”. I would agree that Baines deserves “rewarding” for the brilliant service he has given Everton the last few years and even more so now he has proved to be so dedicated to our club. In my opinion this should be our immediate priority.